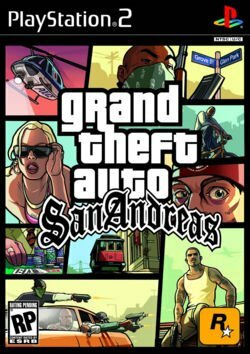 Here is an essay I did for my Media Studies Level 100 course last year on discourses and Grand Theft Auto: San Andreas. Enjoy! Grand Theft Auto: San Andreas is one of the best selling games available that plays with discourses in society. GTA: SA uses satire to reveal discourses in capitalist societies, delving into social satire and the justice society. American culture is mocked using America’s obesity problem and violent gang behaviour. GTA: SA uses parody and self-reflexivity to mock different discourses in media and game culture. San Andreas deals with discourses in a variety of ways, and in the end do we all just take ourselves too seriously by adapting strictly to certain discourses at work? Social Discourses play a role in each of our lives every day in many different situations. From how you behave in public transport to how you act at a party or talk at a formal meeting. There are expectations in play, and anything you do outside these expectations may cast you off as an outsider. Angenot says, discourses “systematically form’ the objects of which they speak”, (1979). With the recent emergence of video games becoming more than just spaceships on a screen, discourses have worked themselves into games whether they are reflections of our normal reality or ones created specifically for games. Grand Theft Auto: San Andreas is the latest game in the popular Grand Theft Auto franchise. Set in the fictional state of San Andreas, GTA: SA is a parody of American culture, featuring town look-alikes, Los Santos (Los Angeles), San Fierro (San Francisco), and Las Venturas (Las Vegas). The main playable character is named Carl Johnson (CJ) and is back in San Andreas after leaving gang life, only to return much later to work with his old gang members after being framed for his mother’s death. The key aspect to the Grand Theft Auto games is the sandbox style gameplay. Players experience the freedom of doing anything they want in a living, breathing artificial world. Taylor goes to say most action games are stripped of social relevance and have no political or social contexts. And this is not just because of setting differences; a lot of so called ‘real world’ games may be based on real life but where is the context? GTA’s satirical examination of society is a new thing in games and the only way forward if games want to stand alongside film and television as an art form. The way GTA: SA uses social satire is very much like South Park and Family Guy, using satire to criticize modern-day social structures. GTA: SA is a game, but at the same time, also a social critique. such as car chases, roadblocks and even a following helicopter if your star rating is high enough. There are two main discourses at play; citizens abiding the law, and criminals participating in illegal acts. Fast food restaurants have been highly criticized for America’s growing obesity problem. GTA: SA shows players the implication of eating only fast food. Taylor discovers that as with the names of the cities, the names nearly resemble actual food chains, “Cluckin’ Bell” (Taco Bell) and “Burger Shot” (Burger King). CJ needs to eat to restore health by eating at these places, only to gain weight which affects CJ’s performance. This weight can be worked off by a number of physical activities such as the gym, swimming, running and biking. With the amount of obese people in the United States, Americans now see it as a natural part of life. So via a twisted logic, having only the option of fast food allows the player to see the full effects of eating convenience food. CJ starts working with his old gang in Los Santos called The Grove Street Families, so a lot of the missions in the game tend to revolve around what GTA thinks gangs get up to in their day to day lives. Leonard describes the racial implications behind African Americans being shown with violent and sexual behaviour. But Carl is one of the few ‘black’ video game characters in existence. Denying Black characters a role in games, is racially prejudiced and shows that we are unfortunately still a ‘white’ dominated society. Race culture discourses are a good thing and contribute to the diversity of the planet, but why do we still have racist discourses? Discourses that believe ‘black’ people all act and talk in a similar way. Grand Theft Auto: San Andreas is not purposefully out to upset people, but to show us that race issues are still around. Since the beginning of the series, Grand Theft Auto satirizes the media, including game culture. San Andreas is not afraid to acknowledge it is a game via subtle self-reflexivity. David Parry finds one example of this, a sign on top of a bridge in the game. “There are no Easter Eggs here. Go Away”, a reference to a sign in GTA 3, that shows, “You weren’t supposed to be able to get here”. The game developers are talking to the player directly through these signs, changing the usual discourse of a typical game, where most try to immerse the player in the experience. Even the term ‘easter egg’ is gamer’s jargon for secrets inside video games, not really intended for the main product. Another sign on the same bridge reads, “Bridge Facts, length – 150.7 m, height – 60.3m above sea level, 16000 polygons inc. LODs, 600m draw distance, 11 textures, takes up a staggering 1.27mb of disc space.” Again GTA: SA refers to itself as a game, even using the technical discourse of game development, a parody of the realism they are trying to create. Tropicarcinoma, an anti-tan cream made from volatile metals such as aluminum, boron and magnesium. Reflecting a capitalistic society, these radio commercials parody commercialism and radio itself. Grand Theft Auto: San Andreas is a great example of a game using discourses in a multitude of ways. Social satire and the justice society bring to light the expectations we hold. American culture is stereotypically defined by obesity and gangs. The media and games specifically, are parodied via self-reflexivity. If only there were more people that could enjoy GTA: SA’s satirical look back on society. Instead Grand Theft Auto is demeaned by people over 30 with a limited view on video games. Times are changing nevertheless, and as the gaming audience grows up, game developers will be encouraged to communicate more deep ideas through the interactive medium, like social discourses, satire, parody, and self-reflexivity. Taylor, Laurie N. “From Stompin’ Mushrooms to Bustin’ Heads: Grand Theft Auto III as Paradigm Shift”, in The Meaning and Culture of Grand Theft Auto: Critical Essays, McFarland & Company, Inc., Publishers, 2006. pp. 115 – 125. Unger, John A. Kingsley, Karla V. “Positioning and Creating the Semiotic Self in Grand Theft Auto: Vice City and Grand Theft Auto: San Andreas”, in The Meaning and Culture of Grand Theft Auto: Critical Essays, McFarland & Company, Inc., Publishers, 2006. pp. 177 – 198. Byron, Simon. Curran, Ste. McCarthy, Steve. “Grand Theft Auto III”, in Game On! From Pong to Oblivion: The 50 Greatest Video Games of all Time, Headline Publishing Group, 2006, pp. 84 – 89. Garrelts, Nate. “An Introduction to Grand Theft Auto Studies”, in The Meaning and Culture of Grand Theft Auto: Critical Essays, McFarland & Company, Inc., Publishers, 2006. pp. 1 – 15. Leonard, David. “Virtual Gangstas, Coming to a Suburban House Near You: Demonization, Commodification, and Policing Blackness”, in The Meaning and Culture of Grand Theft Auto: Critical Essays, McFarland & Company, Inc., Publishers, 2006. pp. 49 – 69. Parry, David. “Playing With Style: Negotiating Digital Game Studies”, in The Meaning and Culture of Grand Theft Auto: Critical Essays, McFarland & Company, Inc., Publishers, 2006. pp. 226 – 243.